For marine engineering materials, it is required to have high strength, resistance to corrosion of hydrothermal fluids, anti-vulcanization, anti-microbial adhesion and high toughness. The titanium metal is called "Ocean Metal" because of its excellent lightweight, high strength and corrosion resistance, especially its ability to resist the erosion of saltwater or seawater and marine atmospheric environment. Titanium is widely used in marine engineering, especially suitable for light, marine equipment. It is one of the new key materials in the marine engineering field. The applications of titanium alloys in oceans are as follows. Condensers are important equipment in coastal power stations and nuclear power stations, and the cooling medium is seawater. Conventional condensers are made of steel and copper alloy materials, but they have poor corrosion resistance and short service life. Under the action of seawater, especially polluted seawater, copper alloy condensers are prone to pitting corrosion, hole corrosion, stress corrosion and fatigue corrosion, which led to equipment leakage and caused significant economic losses. The practice at home and abroad has proved that titanium is the most suitable material for condensers in power stations. The titanium condensing apparatus used in coastal power station has many advantages, such as good corrosion resistance, long life, high heat exchange efficiency and good economic benefit, etc. A typical example of titanium used on ships is the Russian Typhoon-class nuclear submarine, which has a titanium shell. Due to military needs, the nuclear submarine has a dual shell structure, and its double shell shares 9000t of titanium, which makes it has the advantages of no magnetism, deep diving, fast speed, low noise and few maintenance times. Desalination has become the main way to get fresh water in water-deficient areas such as the Middle East. In the production method of seawater desalination, the multi-stage flash evaporation method has the highest reliability and most application. 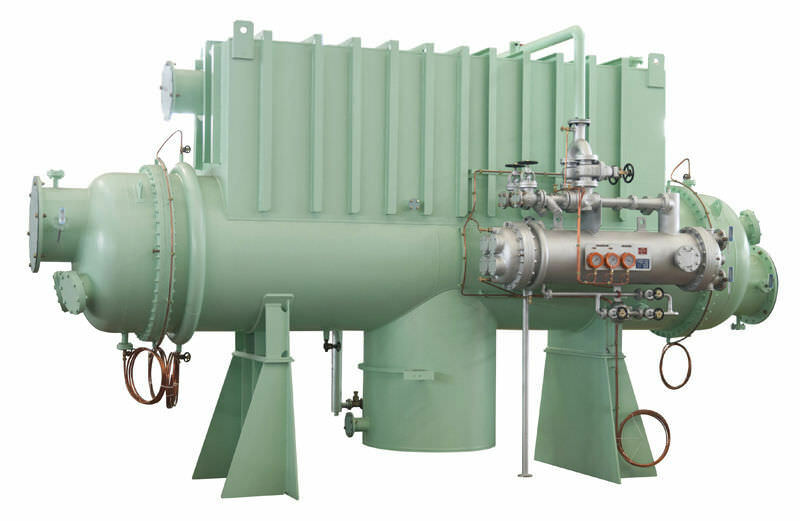 The equipment of this method is mainly composed of seawater heating, heat recovery condenser, heat output condenser, ventilation condenser and jet compressor. A large number of heat transfer pipes are used in the heat exchange area, and the original copper alloy pipes have been replaced by titanium pipes because the copper alloys are not resistant to corrosion. Titanium alloy is resistant to high-temperature ion corrosion and can be widely used in the evaporator of seawater desalination plant, and it also has strong corrosion resistance to chlorine and is the preferred material for heat exchangers of seawater desalination equipment. The titanium alloy of offshore drilling platform has high strength, low density, good corrosion resistance and good toughness, which makes it the best choice for offshore drilling system equipment such as vertical pipe, drill pipe and conical stress joint. The composite application of titanium and steel has contributed greatly to the cost reduction and benefit improvement of the offshore drilling system in more cases. In the past few years, the application of titanium alloy components in offshore oil drilling system has increased significantly. Previous: Will Energy Cells be replaced by New Fuel Cells in the Automobile Industry? Next: How Can Nano Tungsten Disulfide be used today?